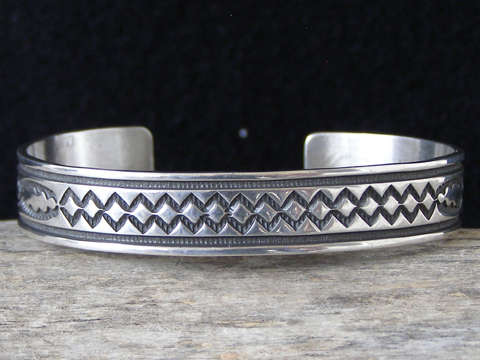 Albert Jake Stamped Sterling Bracelet size 6 3/8"
This slimline stamped Sterling cuff bracelet is deep-stamped with banded horizontal stampwork motifs. Deep grooving along the edges of the cuff complements the main design patterns. Hallmarked A. Jake and stamped Sterling inside.